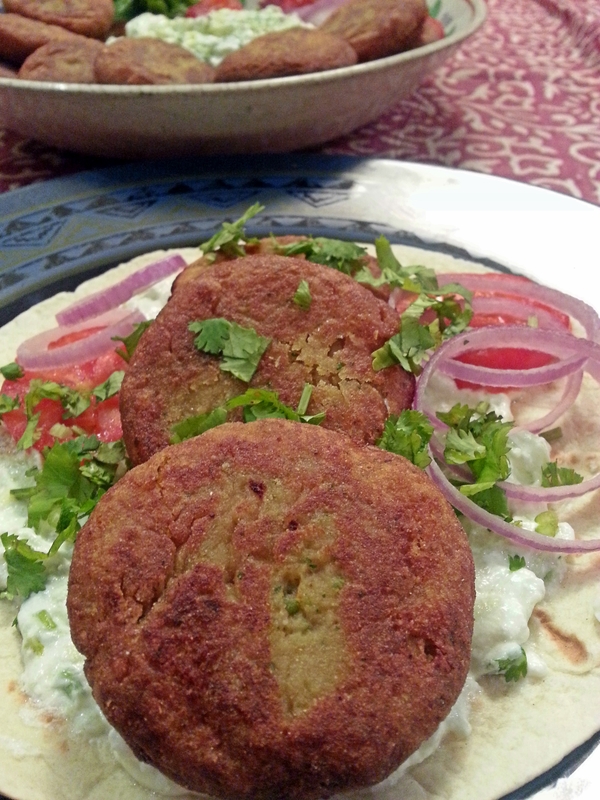 My husband and I absolutely love Middle Eastern cuisine and Falafel is one of our favourites. We had a few friends over and as I had a large bowl of cooked chickpeas i thought why not have some middle eastern yumminess with our drinks. So here is the recipe i hope you enjoy them as much as we did . In a food processor, combine the chickpeas, onions, garlic, cumin powder, coriander powder, chilli powder, fresh coriander leaves, egg and lemon juice. Pulse to combine and season with salt. the mixture will not be smooth, but it should not have large chunks. Add in the baking powder and 1/3 cup of flour and pulse again to combine thoroughly. Remove the mixture to a bowl and chill in the refrigerator for 30 minutes. Take the chickpea mixture out. Add enough oil to a large frying pan so it reaches half inch up the sides and heat it over medium heat. Meanwhile drop spoonfuls of the chickpea mixture onto a plate with 1/4 cup flour. Roll into balls on the floured plate and press gently into patties fry in batches of hot oil for about 3-4 minutes each side and drain on paper towels. Coarsely grate the cucumbers and sprinkle over the salt. mix well, put into a colander and suspend over a deep bowl, leave to soak and drip for at east one hour or a bit longer. 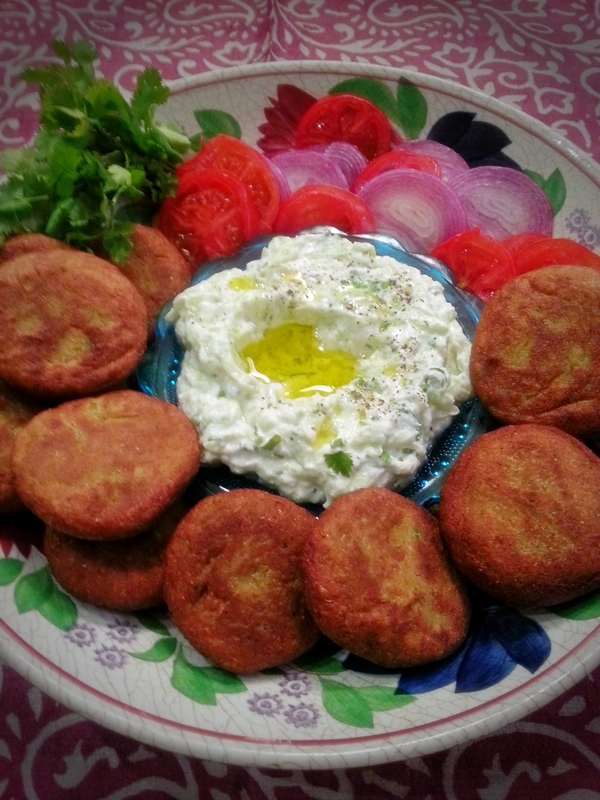 Manually, squeeze out as much moisture as you can from the cucumber, then place it in a bowl and mix in the yogurt, lemon juice, garlic almost all the oil, the pepper and the dill or mint. Turn everything into a serving dish and chill in the fridge for at least 30 minutes. When you are about to serve, trickle over a little more olive oil and grind over some extra pepper. Always serve very cold. 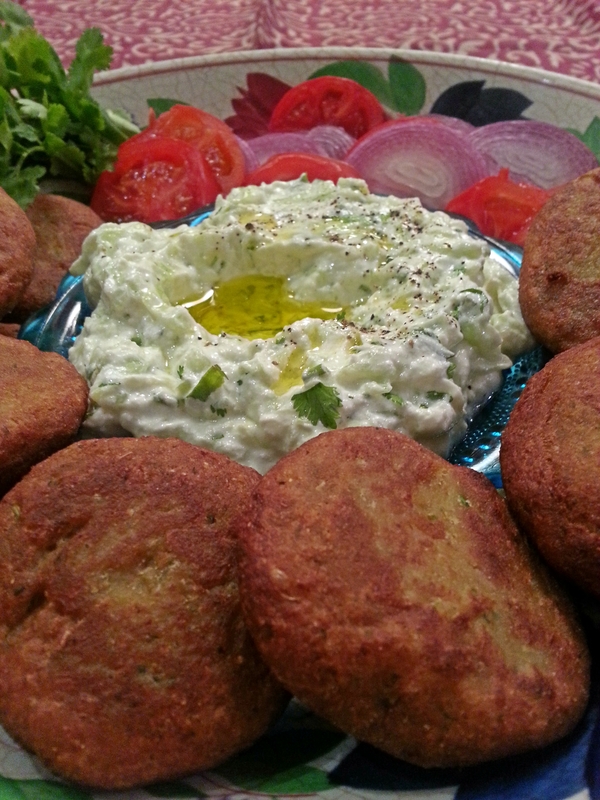 Serve the falafel on a bed of lettuce with sliced onions and tomatoes and tzatziki. One of my favourites to make and eat! Your dish is looking great!